Photos of damage to the barge CBC 7026 and barge TTI-150 after they collided near mile marker 341 in the Intracoastal Waterway, Dec. 23, 2013. U.S. Coast Guard photo. The Coast Guard has responded to a collision between two barges in the vicinity of Siever’s Cove on Bolivar Peninsula, in the Intracoastal Waterway. 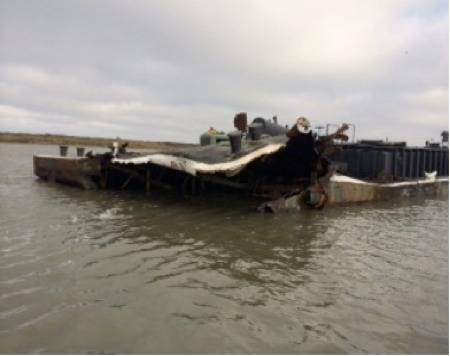 The captain of the tug pushing the barge TTI-150 contacted watchstanders at Coast Guard Marine Safety Unit Texas City to report this barge's collision with barge CBC 7026. A 25-foot Response Boat from Station Galveston was sent with a team of incident responders, marine inspectors, and marine casualty investigators, to conduct a preliminary investigation and mitigate any possible further risk to the environment or the mariners aboard the vessels. 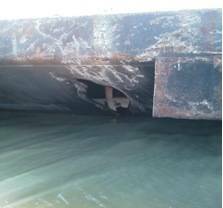 Both barges were damaged, but are currently secured and in a stable condition. No injuries or pollution have been reported or observed. The CBC 7026 had approximately 945,000 gallons of crude oil and was being pushed by the tug Lake Charles. 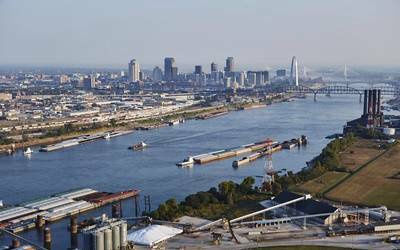 The barge TTI-150, loaded with approximately 1,500 tons of calcium chloride, was being pushed by the tug Alex D.